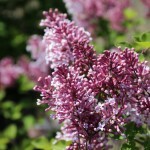 A dwarf, reblooming lilac with fragrant lavender-pink flowers. 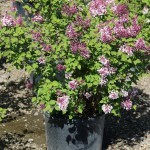 Blooms heavily in the spring, and then with adequate water and occasional light pruning, throughout the summer and fall. It has excellent resistance to mildew. Grows in full sun to part shade, in a well-drained soil. This is a complex hybrid that was developed in France.